So... Where's the tape deck ? We had a chance to catch up with Jason from TubeCore, so we decided to ask him a few questions. TubeCore currently has a Kickstarter running to launch their product the TubeCore Duo. 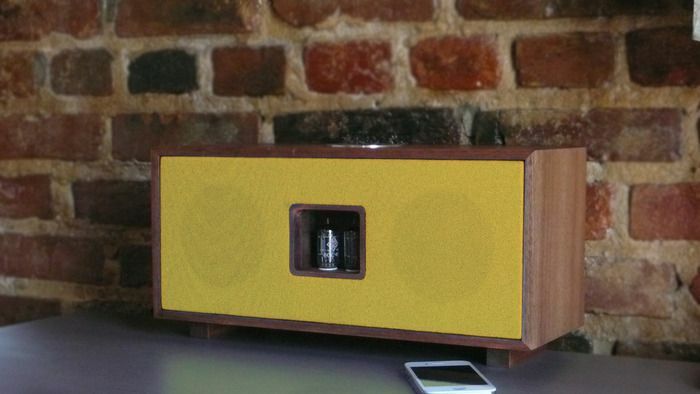 The TubeCore Duo is a hackable, retro inspired modern boombox that sports all the goodies. Streaming via WIFI and Bluetooth, to a hybrid vacuum tube amplifier powerhouse inside. There’s even a Raspberry Pi running XBMC. [su_dropcap style="1" size="2"]Q[/su_dropcap]So tell us your inspiration for creating the Duo. [su_dropcap style="2" size="2"]A[/su_dropcap]I grew up in recording studios and on stages. I cut my teeth on HiFi and couldn’t find exactly what I wanted. I wanted to combine solid HiFi principles to small form consumer audio; a sort of HiFi for everyone. I wanted to build something that didn’t exists and love music. So the choice was natural. [su_dropcap style="1" size="2"]Q[/su_dropcap]You’ve obviously already passed your funding goal, do you have any concerns at this point ? [su_dropcap style="2" size="2"]A[/su_dropcap]Logistics. When I started this, my biggest concern was getting the 56 I would have need to fund out the door and use the profits to reduce my need for off the shelf solutions and have my hardware custom designed. Because of the huge support of our fans, we have been able to develop some key relationships with our suppliers and have drawn the interest of some national and international distributors. While this relationship building is critical, with an on off system we are burdened with the task of developing 10 times the relationships we would have needed before. More input channels are being created and the time dedicated to maintaining each has drastically increased. All said, I have compensated by sleeping less. You get used to it actually. [su_dropcap style="1" size="2"]Q[/su_dropcap]How about technical hurdles with the Duo. [su_dropcap style="2" size="2"]A[/su_dropcap]In the beginning our biggest hurdle was integration. Since we designed in so many systems into the Duo, tying them together properly was critical. Since this was outside of my expertise and I was developing Tubecore to be global, I consulted with the electronics designers at Ubld.it to create an entire system of systems that was not only expandable, but utilized common open-source materials that people are not only familiar with operating, but actually comfortable with using. This is the key to the Duo; infinitely modifiable and universally upgradable. [su_dropcap style="1" size="2"]Q[/su_dropcap]Let us jump right into it, what can you tell us about the Duo that the public doesn’t already know ? [su_dropcap style="2" size="2"]A[/su_dropcap]Not while the campaign is going on. Everything is hush-hush until final decisions are made and prototypes tested. [su_dropcap style="1" size="2"]Q[/su_dropcap]You mentioned including open-source tech. For those who are unaware, what hardware are you referring to? [su_dropcap style="2" size="2"]A[/su_dropcap]The Duo was designed around the idea of an onboard Arm based computer. These small form factor PC’s enable the Duo to become much more than just a speaker. It enables media center capabilities and the ability to dynamically control the system. Since it is tied to an onboard Arduino micro-controller, the onboard computer could, in theory enable a person to control every feature of the Duo, from anywhere in the world. [su_dropcap style="1" size="2"]Q[/su_dropcap]Was hackability of your product a concern from the beginning or did it just work out that way ? [su_dropcap style="2" size="2"]A[/su_dropcap]I think my biggest concern early on was upgradability. I knew the Duo would have shipped in a primitive state if all I managed to do was fund. I assumed I would need to upgrade as I grew the company, but since we have generated so much attention we have been empowered to build a world-class system from the beginning. Now the dream of a system that can be hacked and modified is 6 days from reality and it is more hackable now than ever. [su_dropcap style="1" size="2"]Q[/su_dropcap]Besides listen to music, what do you think your customers will do with the Duo ? [su_dropcap style="2" size="2"]A[/su_dropcap]Besides media I think the hacker/maker market is going to start adding sensors to the Duo. At least I hope so. With a full sensor suite and a more powerful on-board computer, the Duo could become the center of a future home automation system. One that is built to last and based on upgradable hardware. The speaker is one of the few things apart from light bulbs that are generally accepted in every room. They are typically situated in such a way to cover an entire space and this puts them in a perfect position to “see” the entire area. The speaker then becomes the perfect choice to be a room by room home automation hub that communicates with a server and enables voice control and communication between family members and the outside world. I would also like to see someone turn a Duo into a fire-breathing combat robot. I really enjoy watching robot battles on YouTube and I built the Duo to last. [su_dropcap style="1" size="2"]Q[/su_dropcap]What is your advice to makers trying to take a product to market ? [su_dropcap style="2" size="2"]A[/su_dropcap]Don’t hesitate. There is no secret. It is simply a matter of putting yourself out there for people to look at. The more you do it, the more feedback you generate and the more you start to understand exactly what the problem is and how you can solve it. If you have made something you think others would like or something that you think is useful, then get it out there; you’re not alone. [su_dropcap style="1" size="2"]Q[/su_dropcap]What are your plans, post Duo ? [su_dropcap style="2" size="2"]A[/su_dropcap]Right now I am so entirely focused on building the Duo that I haven’t thought about it. We will have to wait and see! The Duo has about week left on Kickstarter. We’ll be waiting to see what hacks come out of the product. Good luck. Less than 2 days. 8 more Duo s will mean that all the stretch-goals will have been reached. This project has been another kickstarter disaster. Three years later and still nothing.